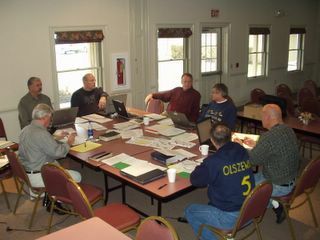 The officers and leadership of the Association of Grace Brethren Ministers (AGBM) this Friday conclude a three-day strategy and planning meeting, held at the Traber Center in southeastern Pennsylvania. AGBM president Tim Boal (upper left) is convening the meeting, and much of the agenda is focused on recommendations issuing out of the study and research done by Jerry Young (lower right) during this past year. Those attending the meeting, in addition to Boal and Young, include Lee Dice, Dan White, Joel Richards, Ken Bickel, and Bud Olszewski. Randy Weekley was unable to attend because of illness.